Fill these chocolate Christmas cookies with either red or green frosting. Both are flavored with mint extract. 1 of 2 Sift together flour, cocoa, baking soda and salt into bowl; set aside. In large bowl, beat sugar and butter until smooth. Beat in egg, then vanilla and mint extract. On low speed, beat flour mixture into butter mixture. Divide in half; shape each into a log about 1-1/2 inches in diameter. Wrap in plastic wrap; refrigerate 4 hours. 2 of 2 Heat oven to 375 degrees F. Cut each log into slices, about 1/8 inch thick; place on ungreased baking sheet. Bake at 375 degree F oven for 8 to 10 minutes or until almost firm. Transfer cookies to wire rack to cool. 1 of 1 Beat confectioners' sugar, butter, milk and mint extract in bowl until spreading consistency. Tint half with red food coloring, and other half with green. 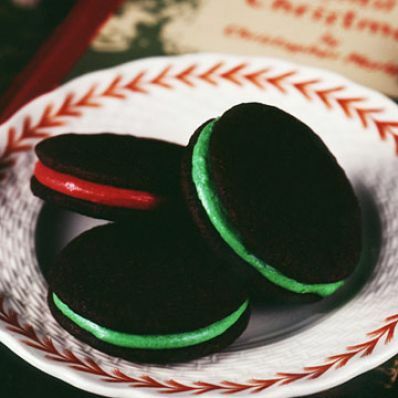 Spread flat side of one-quarter of cookies with red filling; another quarter with green. Top each with a plain cookie. Chill.